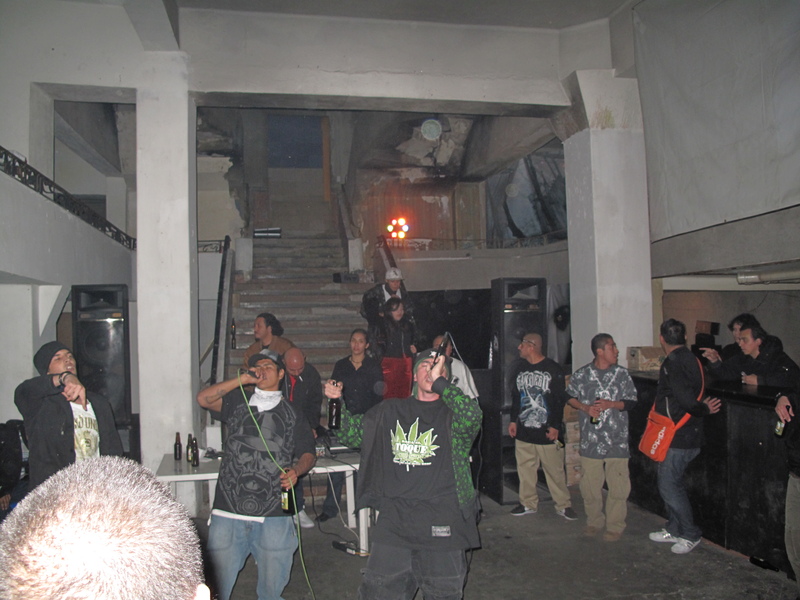 Above, Rapper 2Phase on the mic (center), at a January 2010, rap event near Centro. It was a 7 hour rap show in a hall connected to Cría Cuervos, a punk/goth space. Pictured is the entire concert stage, the bar was off to the right. For my presentation today, I invited 2Phase and Yoez. More about them during our chat, but I wanted to give a little background on why I chose these two, of the literally hundreds of rappers trying to get their voices heard in D.F. 2Phase was one of the first rappers I saw perform when I got here in the winter of 2008 (Listen to some tracks from his 1st album, here and here.). He was performing in another punk space, El Under, in Colonia Roma. The reason why I picked him is because, first, he speaks English. And, two, he´s not only a rapper, but a producer for Revolver Productions. I felt that he could talk about, not only the rap scene, but also the technical aspects of production and getting product and merch out to the masses. Yoez is a rapper I heard a lot about, because she was a member of D.F.´s first all-girl rap group Rimas Femininas. I researched this group for a story that appeared in Latina magazine, but I never got a chance to talk to Yoez. Her work is personal and she´s got a stage presence that can´t be ignored. I´ve seen her destroy crowds at Foro Alicia, usually over some heavy West Coast beat. *Super shouts to Wayne Marshall for inviting me as a guest.